The first three seasons of HSB are available for streaming on Hulu Classic. Season one is only 17 episodes, in case you want to catch up and be ready for my weekly reviews of season two this summer. As of now, the plan is to review the season premiere and finale individually and then tackle two episodes a week in the between those bookends. Season two has 18 episodes, so that should result in ten weeks of posts. Stylistically, I don’t plan to do much recapping of events. I’ll assume that you’re familiar with the episode, series, characters, etc. Expect more for this first post than you’ll see moving forward. I think it’s damn fitting that we kick off this venture with a show and season from the initial stages of NBC’s “Must-See TV.” HSB snuggled more tightly into the 10 p.m. Thursday timeslot with this episode and didn’t leave there for six years. This is, in many ways, part of the birth of recent television history as we know it. All right then. Take a seat, it’s ready for roll call. Previously on Hill Street Blues: In the season one finale, young officer Joe Coffey was shot during a routine traffic stop, leaving his life in the balance. Alcoholic, slob and all-around screw-up LaRue finally attended his first AA meeting, only to find his calm, cool chief Frank Furillo in attendance as well. After searching for evidence to exonerate Weeks, a white officer who appeared to purposefully shoot a black suspect, black officer Neal Washington comes through and keeps Weeks out of the slammer. As craft, the first season of Hill Street was as good as series television has gotten. It goes without saying that American commercial television is hostile to the nuance and resonance of art, but Hill Street demonstrated that the instinct for craftsmanship does not automatically disqualify a show from noticeable, if not epoch-making, popularity. I used this quote to frame my exploration of that first season, mostly as a way to engage with the series’ legacy and how it helped usher in a new era of television. But after watching that admittedly-great first season of television, Gitlin’s quote takes on new meaning, one focused on expectations. 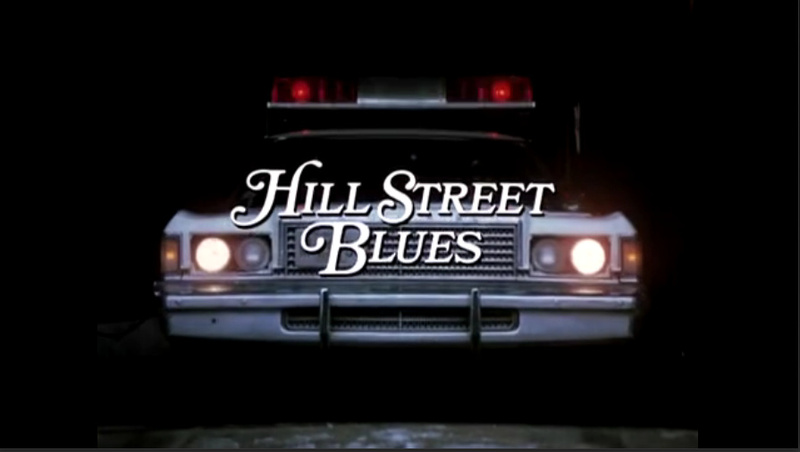 In its first season, Hill Street Blues garnered fantastic reviews from critics, mostly got renewed because of those reviews (and Brandon Tartikoff’s faith in the creative team) — becoming the lowest rated series in the history of television to get a second season—and then proceeded to clean up at the 1981 Emmy Awards (categories won: Series, Lead Actor, Lead Actress, Supporting Actor, Writing, and Directing; You know, six of the big seven). Even though the passage of time allows me to know that HSB ran for seven seasons, I logged on to Hulu the other day with slight hesitation. What if the second season wasn’t as good? Gitlin suggested as much in the book, noting that the series lost what made it so original in the first place (the intense character focus) and gained car chases and shoot-outs, set pieces typical to television of that era. Co-creator Michael Kozoll, who somewhat famously told Gitlin that writing police procedurals was like having a child with a learning disability, was already burnt out and downgraded to consultant. Plus, a writers’ strike delayed the start of production. Again, clearly I knew that the show didn’t suddenly become awful. I still didn’t want to lose that way HSB made me feel last summer, and had the internet existed in 1981, there would have been tons of stories about a production in moderate turmoil with all sorts of expectations to meet (Imagine if Howard Gordon left Homeland tomorrow). Moreover, Gitlin’s comments about the show devolving as early as season two had me curious. Would there be signs as early as the season two premiere that Steven Bochco and company were sacrificing even a little bit of what made Hill Street so special, simply in hopes of collecting more Nielsen viewers? I won’t spend too much time recapping everything I said about the first season when I wrote about it last summer (please do check those reviews out though), but briefly: Hill Street Blues worked so masterfully in season one because Bochco, Kozoll, and the rest of the team always knew actually who the characters were. From the very beginning, the performers slid right into well-constructed characters and, in conjunction with the writing staff, brought them to life in a fully-realized, really special way. 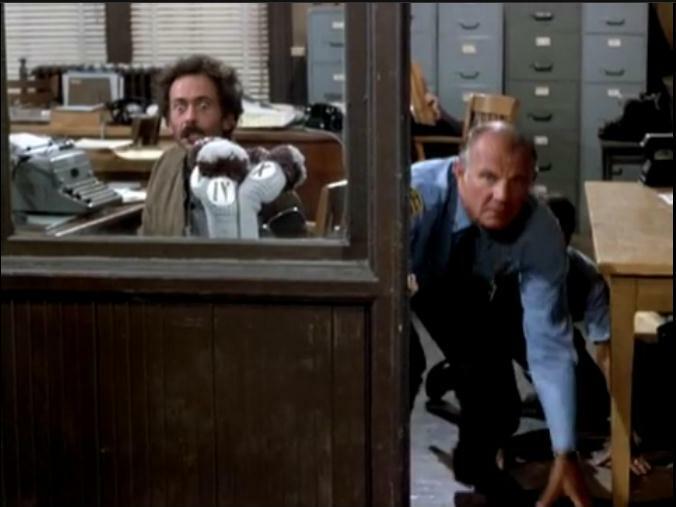 HSB is credited with popularizing a certain level of character serialization within the procedural environment of the police station, and it’s celebrated for the ease with which it handled so many characters and stories at time. But what I’ve seen less of in my reading about the show is how well those two major elements were impacted by the quality of the characters themselves. A show can have as many characters or as many stories as it wants, but unless those characters work and the audience actually cares about them, it doesn’t really matter. This is perhaps a simple point of analysis, but the most important one (and honestly, one that people—especially executives—too often forget): the characters make everything work. The dozens of storylines meld together seamlessly, threads carry over, and oftentimes certain characters fade in and out of episodes without much trouble. Hill Street Station is one of the more realized settings I’ve ever seen constructed on television, and that is all predicated on the characters feeling like real people. Real people who are there doing a job even when I don’t actually see them on screen. Real people who take the problems we see in the station home with them, probably only making matters worse. The other big consequence of the show’s great characters is that Hill Street can do episodes that feel like something out of a zany workplace comedy, or it can do episodes that would fit right alongside something much darker and sinister. And when HSB is really firing on all cylinders, like it is in “Hearts and Minds,” individual stories within an episode fall all over the continuum between slapstick, odd-ball humor and cynical, brutal drama. This is an episode that begins with a pretty powerful sequence involving a domestic disturbance spilling over into booking, leading to a harrowing shootout, ends with the show’s lead romantic couple breaking up in a naturally wrenching scene, and somehow includes a guy feeding an orangutan an onion in the station house in the middle—and I didn’t think anything of it. But again, that’s what makes this show so wonderful to watch. One has to imagine that local police stations are full of all kinds of people. Not everyone is an attractive, exposition-delivery machine without much of a personality (other than “snaky” or “serious,” which is basically where all characters fit on today’s procedurals). 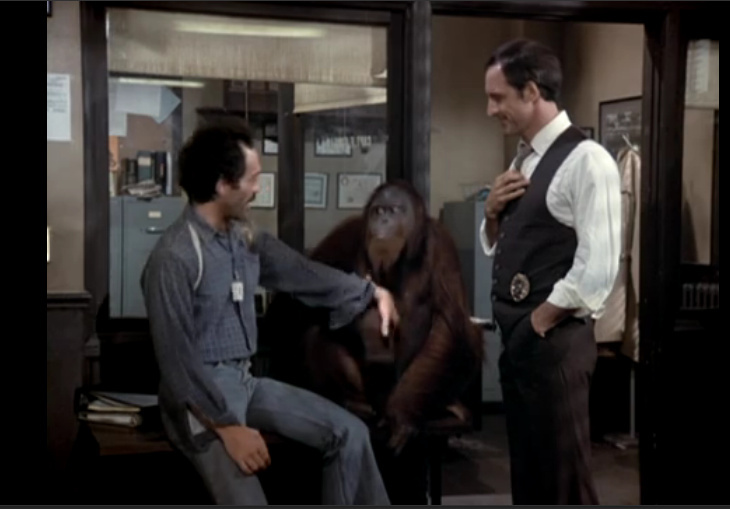 Because of HSB‘s dedication to portrayal this certain reality, Belker, the always-insane undercover street cop, absolutely fits alongside an orangutan, just as the more grounded characters like Chief Frank Furillo or officer Bobby Hill fit alongside each other and Belker. You have to be a bit of a wack-job to be a cop, and some folks are just obviously wack-jobs. HSB displays all kinds and transitions between them all without much fumbling. Back to those expectations I mentioned: “Hearts and Minds” is pure HSB. The character work is still strong, as I hinted at. The directing and editing is still purposefully frenetic and well-paced. And despite the low ratings or the critical acclaim, the stories here aren’t remotely different than what the show was doing in the back half of season one (after it had worked out a few inevitable kinks). In fact, so many of the episode’s stories are so character-based and plot-light that they mostly carry over from season one anyway. Youngster Coffee’s recovered from his gunshot wounds and is ready to return to the street. Furillo and D.A. Joyce Davenport are still having a relationship on the down-low, and he still wants more. Older sergeant Phil is still struggling with the ravenous sexual appetite of his lady-friend Grace Gardener. The gangs are still a big problem. Further, the plots actually introduced in this episode mostly only exist as catalysts to pair off the characters and let them have entertaining conversations. Although not as advanced as Aaron Sorkin and Thomas Schlamme’s walk-and-talks, the visual grammar of HSB—crafted by Bochco, Kozoll, pilot director Robert Butler, and line producer-turned-director Gregory Hoblit—creates an atmosphere powered by constant movement, which distracts you from the fact that most scenes feature cops talking to each other about their lives. Here, the precinct is tasked with finding a missing kid and many of the main characters go on canvassing trips as part of that process. Nothing that integral happens plot-wise, but the script mostly subtly uses these scenes to reintroduce characters (Renko’s a complainer and a racist, Bobby’s a calm and collected, etc.). Finally, other big narrative developments are in place as set up. Danny Glover, he of Gone Fishin‘ fame, guests as a reformed former gang member and author who claims to want to help Furillo and the Hill control the gang violence (a big problem in season one), but Belker’s street snitch suggests Glover’s Jesse John Hudson is actually the same old thug, only more educated and better dressed (so, he’s Stringer Bell 1.0?). These two conversations play out in a ping-pong fashion thanks to particularly adept editing. Elsewhere, Furillo turns down his estranged wife’s sexual advances to spend time with Davenport, only to give her an ultimatum about making it official—and she leaves him. So in a second season premiere, coming off a poorly-rated first season that basically only critics loved, Hill Street Blues builds an episode around quick, less-than-complete reintroductions, more compelling but entirely character-based conversations, and some set up for down the road. Other than the missing kid being found, very little introduced in this episode (of which there is very little) is solved or concluded by the end. And along the way, Belker plays with an orangutan, because that would make sense to the outside viewer. All together, “Hearts and Minds” doesn’t see Hill Street Blues alter its approach to storytelling to reach a new audience, even though a new, larger audience was likely tuning in after those big Emmy wins. This episode doesn’t hold those new audience members’ hands and really doesn’t inject flashier, conventional “cop show” tropes. Sure, there’s an intense shoot-out to begin the episode, but the series often did things like that in season one, and the reactions of many of the characters right after said shoot-out signifies a slightly winking acknowledgement from the show that it isn’t going to change. This idea is further exemplified by a mid-episode sequence that, at the jump, appears to be a high-speed chase leading to a stand-off. But within moments, the stand-off turns into a comedic set-piece once Frank and Howard realize that one of the criminals is locked in the trunk of a car, a trunk Howard keeps pounding on with a flashlight as if that’s going to open it. I wouldn’t go as far as to call a sequence like this a middle finger to anyone who might have wished the show be more appealing to a mainstream audience, but it’s certainly a sufficient, celebratory tease. And yet, it still makes sense to me that audiences began to find the show in this second season. Hill Street Blues‘ biggest strength (the characters) is what has guided so many dramas to populist success. Despite all the mythology nonsense, Lost was beloved because those people were beloved. Same thing for the Bartlet team on The West Wing, the doctors of ER and Grey’s Anatomy, or Scully and Mulder on The X-Files. All of those shows had varying degrees of success with big plots or thematic depth, but they caught on because of appealing, relatable characters. If this episode is any indication of where HSB is headed in season two, it’s going to be an entertaining, weird ride.